ROSAMOND – A man suspected of robbing a Rosamond area Albertsons with a fake gun Monday night was captured Tuesday morning, authorities said. Frank O’Sullivan, 54, was arrested around 9:43 a.m. Tuesday, Feb. 20, after deputies and SWAT personnel entered a residence on the 1500 block of Franklin Avenue in Rosamond, according to a news release from the Kern County Sheriff’s Office. The Albertsons robbery occurred around 10:20 p.m. Monday, Feb. 19. “A masked male suspect pointed a handgun at a clerk and demanded money and alcohol. The suspect then left the store and fled in a two-tone blue/gray GMC pickup truck with a ‘wolf’ sticker on the back window,” the news release states. Around 2 a.m., deputies spotted a pickup truck matching the description parked at a residence in the 1500 block of Franklin Avenue, according to the news release. “Deputies attempted to call the suspect out via public address announcements, but there was no response. A perimeter was established around the residence and a SWAT callout was initiaited,” the news release states. Authorities then served a search warrant at the residence and found O’Sullivan inside. “A silver-colored simulated firearm, mask, and clothing worn during the robbery were located near O’Sullivan when he was arrested. 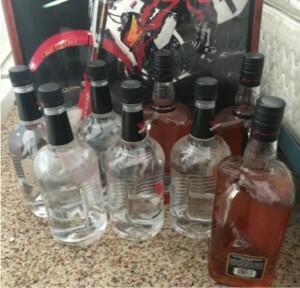 Eight bottles of alcohol taken during the robbery were also recovered,” the news release states. O’Sullivan was booked into the Central Receiving Facility on numerous criminal charges. 6 comments for "Suspect captured in Albertsons armed robbery in Rosamond"
he retarded why would he frickin do that! What a tard! Should have at least stolen some premium liquor, instead of bottom shelf plastic bottles! I like Kern county. Sending SWAT for a grocery store robbery. That’s keeping your community straight. I’m as opposed to police over reactions as anyone, and even I can’t argue with using SWAT to go in after a guy who was last seen doing an (apparently) armed robbery. Doesn’t really matter what he was robbing. Glad no one got hurt and that justice was served. Soon no one will be afraid and live in a new world where there would be peace and not worry about these kind of things. Micah 4:4. Is this same Frank that was working in Mojave at Scales Composites he was my nabor in Palmdale super human being if this is he i can not belive what is happening with you Frank?